There are Internet reports that the Vatican's Secret Security Service has been given, as its most highly prioritised current operation, orders to hunt down H E Archbishop Carlo Maria Vigano. Such reports give us quite a new insight into daily life in the City of Saints. "Il nome e Bond ... ... Giacomo Bond ..."
I take this opportunity to make it absolutely clear that there is absolutely no truth whatsoever in any rumour that Mgr Vigano is under the protection of the Ordinariates; or in any report that he is being moved from Safe House to Safe House within those Ordinariates, always just one step ahead of 'Smersh' Parolin's hit squads. And, as far as I know, it is simply not true that Vigano has secured a Reader's Pass to the Bodleian Library and habitually sits at the third desk on the left as you enter the Patristics Room. Nor do I consider it at all likely that the Crown will nominate him to a Regius Professorship in Ecclesiastical History. One should not believe everything one hears. ‘SMERSH’ gave me a good chuckle. Bravo, Father! Surely the ordinariate claims all that was best in English Catholic patrimony, and that includes priest holes... but then I believe a great amount of that work went towards protecting Jesuits. Father, you've mentioned before the practice of fasting on the Vigils of certain Feasts. Of course, for now it can only be revived in a voluntary, private way. Given that tomorrow is the Feast of the Holy Cross, I was curious what such a practice looks like. Particularly, I'm curious about how it clashes with 1st Vespers. 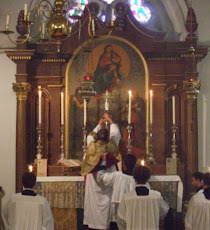 The American Ordinariate celebrates some feasts with 1st Evensong. Is the fast lifted after Evensong, or at the beginning of the next day? Unfortunately, this stuff is a little difficult to determine online as most commentary focuses on restoring practices still active in 1962. For your younger readers (like myself) your commentary would be greatly appreciated. In the Eastern Church the Day itself is a fast day - The Universal Exaltation of the Precious and Life Giving Cross. From Wikipedia: "In Byzantine liturgical observance, the Universal Exaltation (also called Elevation in Greek Churches) of the Precious and Life-creating Cross commemorates both the finding of the True Cross in 326 and its recovery from the Persians in 628, and is one of the Twelve Great Feasts of the church year. September 14 is always a fast day and the eating of meat, dairy products and fish is prohibited. The Feast of the Exaltation has a one-day forefeast and an eight-day afterfeast. The Saturday and Sunday before[note 2] and after September 14 are also commemorated with special Epistle and Gospel readings[note 3] about the Cross at the Divine Liturgy." I don't think Archbishop Vigano is too great a danger, perhaps if found he might be served papers drawn up by the yellow toothed Cardinal Cocco for some sort of canonical procedure. A bigger general danger is that the Holy Father will be quoted likening himself to Christ and the Archbishop to satan, which either severely outrage and enrage, or just cause many to hurt themselves badly from laughing too hard. Dangerous times. Oh what trying times! Let us retreat an rediscover the masters. Secrecy and revelation. The sermon by blessed JH Newman " The Secrecy and suddenness of Divine Visitations". Our Blessed Trinity is in charge....all will be revealed...it is the Lord that will show forth the designs of the wicked. Can we hope for a denial on RT ( Russia Today ) ?? You opine that +Vigano may not be in great danger. It's entirely possible that the Vatican's Swiss Guard will choose to 'forget' this order. You think THEY like boy-rapists?